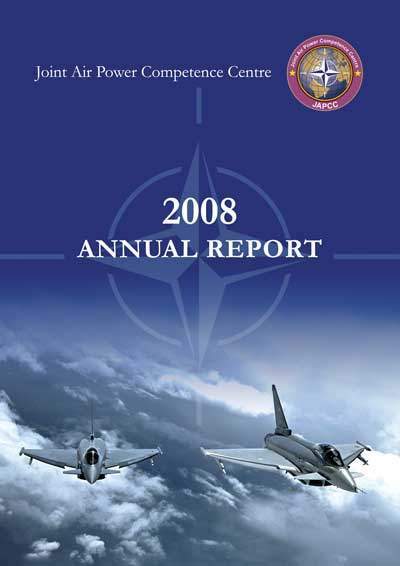 In 2008, JAPCC built upon its hard-earned reputation as NATO’s pre-eminent think tank for developing and enhancing Joint Air and Space Power today and into the future. We continue to maintain a close relationship with both Allied Command Transformation and our Sponsoring Nations, providing timely and relevant advice and products. We are proud of our accomplishments this year, which you will see summarized within this report. I want to especially highlight our NATO Future Joint Air and Space Power (NFJASP) concept and the Space Operations Assessment for NATO. Both these important projects were completed in 2008 and are generating follow-on actions within NATO and our nations. The NFJASP lays out a coherent picture at how we might look at Command of Joint Air Power in an emerging network enabled future. We are working with the Bi-Strategic Command (Bi-SC) to incorporate aspects of NFJASP into Alliance Concepts. Aspects of this work were further developed in another paper, Air Power in Countering Irregular Warfare, which looks at modern contemporary operations, particularly the doctrinal changes Air faces in this challenging arena. The Space Operations Assessment garnered general support for its overarching finding that NATO needs to move forward in developing Space policy and doctrine, but numerous considerations are continuing to slow Alliance progress. We continue to engage at the Strategic Command and National levels to find suitable ways to incorporate the Assessment findings into the NATO military and political process. Throughout the period, we have enjoyed a reasonably stable manning situation, with our nations maintaining manning at around 85%, and all major leadership positions filled. Our reassessment and change in expertise required for some vacant positions has already borne fruit, with Italy committing to fill a new Future Space position this summer. Two other nations have also identified individuals to fill positions that have been vacant for a year or longer. The financial support provided through our Senior Resource Committee continued to provide full funding of our budget. We appreciate the emphasis by all the sponsoring nations to fully fund the travel requirements of their bid positions. Perhaps the best news of the year in the framework of the JAPCC was Hungary’s reversal of their decision to leave the JAPCC and the announcement of their plans to re-fill their bid position this coming summer. Our Annual Air and Space Power Conference continues to grow in attendance and impact. This year we hosted over 220 attendees, including 60 flag officers from across NATO and partner nations. The JAPCC Journal also continues to be a successful avenue to share our work, along with contributions of our industry, government, and academic colleagues, on the Air and Space innovations important to us all. We look back to 2008 as another successful year in supporting NATO and our Nations, but more importantly look forward to 2009 with determination to raise the bar even higher.